Though originally home to Santee Dakota and Ojibwe native people, jurisdiction over the land that comprises Dunn County has been claimed by Spain, France, England and the United States. As smaller territories were formed from the Northwest Territory of the United States (Northwest Ordinance, 1787), that same land was a part of the Indiana Territory (1800-1805), the Michigan Territory (1805-1809), the Illinois Territory (1809-1836) and finally the Wisconsin Territory. Dunn County was created from a portion of Chippewa County on February 19, 1854, and at the time included all of the present Dunn and Pepin Counties (formed in 1858). Its present-day boundaries encompass some 858 square miles. Prior to 1854, all or parts of the land in Dunn County had been part of Chippewa, St. Croix or Crawford Counties for various periods. The county is named for Charles Dunn, first Chief Justice of the Supreme Court of the Wisconsin Territory (1836-48), who was appointed by President Andrew Jackson. Dunn County’s “Seat of Justice” was at Amos Colburn’s at or near the ferry across the Red Cedar River near its mouth at Dunnville. 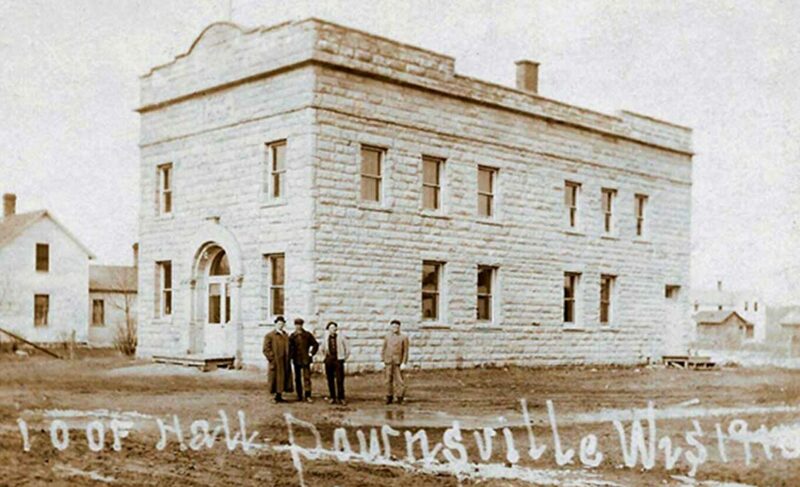 The courthouse in Dunnville burned to the ground in October 1858. After several months of moving from place to place, the county seat was moved to Menomonie on January 1, 1861. Dunn County Wisconsin has a rich history and many historical sites to explore.